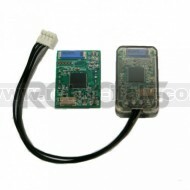 ZIG-110 is a wireless communication module for short distance and it is using Zigbee's Physical layer. €59.74 Special Price! Save until stocks last. - A case has been added to the module to protect the circuit and to make the connection convenient by simply inserting the connect into a port. - Although the basic IR controller is included in the OLLO Bug Kit, users can use the ZIG-110 set to avoid problems where IR control environment is poor such as competitions. - We recommend using the ZIG-110 set when using it to participate in robot competitions.